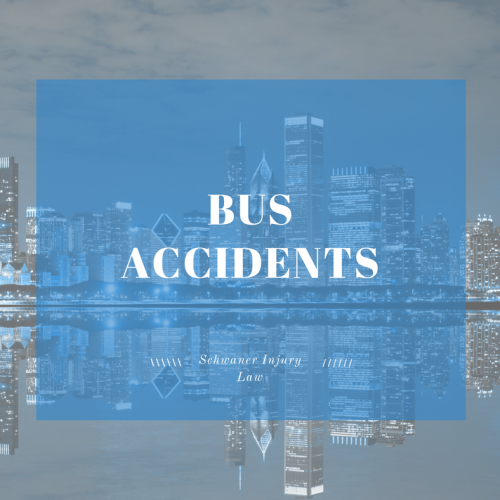 Were you injured in a bus accident in Chicago? If you were injured through no fault of your own, you may be entitled to monetary compensation for your injuries. Can Your Bus Driver Be Held Liable? According to estimates, about 65 times a day, somewhere in the United States, someone is involved in a bus accident. In 2001, almost 300 people were killed and 24,000 were injured in bus accidents according to recent statistics. Of course, it’s impossible to ensure absolute safety every time we ride in a car, rent a limo, take a bus trip or board an airplane, but there are certain things that can make some bus trips riskier than others. While not all bus accidents are the fault of the driver, the most common cause of bus accidents is the driver’s failure to see another vehicle in the road. There are 30,000 commercial buses – tour buses, shuttle buses, city commuter buses and cross-country travel buses among them – and 450,000 school buses on the road every day. Each one has a driver capable of human error or negligence, depending on the circumstances. Size matters. Based on their size and design, buses have numerous blind spots, and it is difficult to see everything around a bus, not only while it is in motion, but also while it is stopped, such as when a school bus is letting children off at a home or at school. Inadequate training. Some bus drivers don’t get enough behind-the-wheel training before they begin driving. Numerous lawsuits involving bus accidents reveal that some companies send drivers out on the road before they’re comfortable or ready, resulting in accidents. Inattentive driving. Driving under the influence of driving while talking on the phone or texting is often cited as a cause for negligence after a crash. Poor maintenance. While a quick tune-up might be all you need to do to keep your car or truck running smoothly, buses are heavy equipment, and require regular upkeep in order to ensure safety. Tires, brakes and other safety features should be checked regularly to ensure safe travels for adults and children who regularly ride. In 2011, 15 people were killed and others injured when a tour bus returning to New York City from a casino swerved to avoid hitting a tractor trailer, overturned and was sliced from front to back when it hit a roadside sign instead. In the case of the NYC crash, the driver told police he lost control of the bus as he attempted to get out of the path of a swerving semi. The driver of the tractor-trailer did not stop, police said. World Wide Travel, the bus company heading the tour, was shuttered after a myriad safety violations were unearthed and were not improved upon after the charter bus crash in the Bronx. Injuries were catastrophic. In addition to those who were killed in the crash, others suffered severed limbs, fractured skulls and other head trauma, internal bleeding and collapsed lungs. While your health and safety is your immediate priority, in the aftermath of an accident, there are a wide range of issues you could face. Your injuries could prevent you from returning to your job immediately, leaving you with bills you cannot pay that can damage your credit or potentially lead to collections, evictions or other financial problems that could become as catastrophic as your injuries. You could suffer from post-traumatic stress syndrome in the aftermath of the accident, requiring long-term access to mental health professionals who can help you recover. Your injuries could require long-term physical therapy or a long-term hospital stay. Consider the man whose arm was severed in the New York City bus accident. His injuries will alter his life forever, and could impact his ability to work, depending on what he did for a living prior to the loss of his limb. Make sure someone calls local law enforcement to file a report after the accident. If you’re able to do so, take pictures of the bus accident scene including injuries that you and other passengers have sustained in order to have evidence should you have a case that goes to trial. After taking stock of your injuries and seeking medical help, it’s important to call a reputable attorney so you are not alone in your fight to help recover damages to cover your expenses not only while you’re working to restore your health, but also afterward if your injuries require long-term care. Take photos of the bus accident scene and all the injuries you sustained. Never sign any documents until you’ve spoken to that attorney. Insurance companies may be willing to pay for immediate health care costs, but future costs – including mental health – are also important. Keep track of all your medical records so you will have detailed accounts of all of your expenses for your attorney’s benefit in court. As we’ve mentioned, many bus accidents occur because of driver negligence. The driver involved in the accident might not have been adequately trained for the job, he or she might have been distracted – a 2015 school bus accident in Tennessee that killed two students and a teacher’s aide was the result of a bus driver who was texting while driving – or they may be driving under the influence. In 2015, a Virginia Beach bus driver for a private school was arrested for driving under the influence in the job after other drivers reported her for reckless driving. Drivers may also be fatigued, as many are pushed to log as many hours a day as possible by tour companies anxious to get tourists to their destinations. If the driver in the bus accident was at fault, he or she or the company the driver represented can be held accountable for damages. In the case of the 2011 crash, the company that operated the bus – World Wide Tours – and the driver, were found to be liable for the accident, which happened as the tour bus was returning from the Mohegan Sun casino in Uncasville, Conn. Buses that were part of the World Wide Tours fleet had been involved in at least two other crashes in the two years before the deadly 2011 incident, and the company had been cited several times for driver fatigue, revealed through driver log records. The bus driver, Ophadel E. Williams, 40, of Brooklyn, was indicted on multiple charges of manslaughter, and was accused of fatigued driving, but in 2012 was found not guilty of felony charges. Civil lawsuits filed by the family of those killed and survivors who were injured were pending at the time. If you were the victim of a bus accident in Chicago you may be entitled to compensation for your injuries. Get in touch with our team today and find out how much your case is worth.